Thanks, SoulTrackers for casting your vote for the "Best Disco Songs." And what great choices you made! 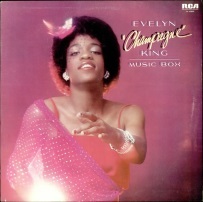 The fantastic Evelyn "Champagne" King topped the voting with her debut hit, "Shame," and there are 99 other inspired choices. So get ready to dance as you check out your picks. And now you can hear our list too, on our new Spotify playlist below! 39 "Funkytown" by Lipps Inc.